The Drisco, a new independently managed hotel situated in Tel Aviv’s American Colony on Auerbach St, is to open in late 2017. The Drisco, a new independently managed hotel situated in Tel Aviv’s American Colony on Auerbach St, is to open in late 2017. 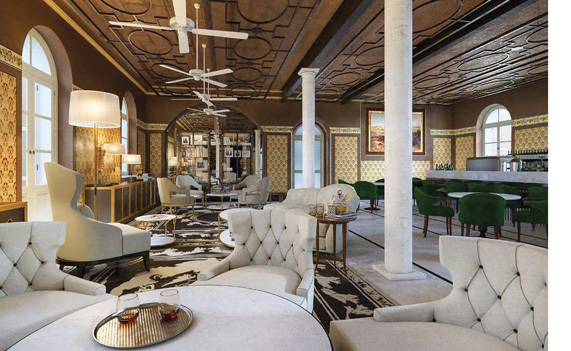 The hotel is built within a renovated building that once housed the Jerusalem Hotel, a prestigious property in pre-State Israel from 1870 to 1940. Between 1958 and the late 70s, the building served a number of purposes, including military headquarters during World War II, a house for Jewish refugees and the home of the Ministry of Education, before lying abandoned. “The original plan was to convert the building into flats, following years of construction to its external façade,” explains Managing Partner Avi Zak. “However, we decided to pay homage to the Drisco Brothers, two American colonists that originally had the vision to build a luxury hotel in the area, and after applying for a permit, we began work in 2016 to create a high-scale hotel.” The surrounding area, referred to as the “Keren Compound,” contains two luxury apartment blocks built within the last three years, partly owned and managed by Zak. The hotel has a total of 44 rooms, six of which are located in an adjacent building where Chef Haim Cohen’s restaurant once stood. “This unique wooden home captures the American style of buildings that were erected in the area many years ago,” explains Zak. “Much of the original structure remains intact and has been carefully restored to allow guests the experience of residing within a piece of history.” The top floor of the two story house features a room with a private elevator entrance. The rooms in the Drisco, averaging 22m², feature wooden parquet flooring, king size beds and are styled with a mix of Israeli and international furnishings. “We wanted to create a calm, elegant space within the rooms, to counter balance the busier design in the communal areas,” outlines Architect Ari Shaltiel, who is responsible for the hotel’s exterior and interior design. “The concept was very much influenced by periods in history, an eclectic blend of Turkish Arab and European charm.” The bathrooms contain a mix of stone and marble furnishings, with blue mosaic wall tiling and self-branded toiletries sourced from local perfumery Zeilinski & Rozen. The suites, spanning 60m², contain a separate living room and stone bath, in addition to a shower. “Twenty rooms come with a spacious balcony, and most offer direct views onto the seafront,” says Zak. In-room spa treatments will be available for guests. The entrance of the hotel maintains original text on the arch, a blessing in German to visitors. Also on this level is a techno gym and lobby lounge with seating area. “We are incorporating Turkish imported stone throughout all of the communal areas and within the bathrooms,” says Zak. “We have also hired a skilled team of German painters to emulate replicas of original wall paintings, for the pleasure of our guests.” An additional third level floor has been constructed, containing five rooms, each with a sea-facing balcony, and a 60m² rooftop bar to serve a happy hour, as well as drinks and bites.